These Round beads are in transparent, Opaque and semi opaque colours and are ready to shiny where ever they are used. All this beads are handmade and made by skilled labours. Can be made in other colors too. Approx 15000 Pcs. in a 1 kilogram. 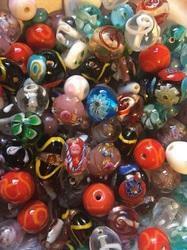 Avail from us beautiful Lampwork Glass Beads at reasonable prices. 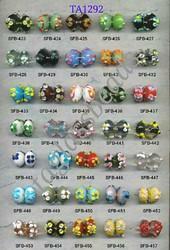 We offer these fancy Lampwork Glass Beads in different designs, colors, and patterns. The Lampwork Glass Beads, offered by us, are frequently used in varied ornaments, apparels, etc. We are Manufacturer and supplier of Lamp Worked Glass Beads. These are high quality handmade lamp worked glass beads. Available in many colors. Seeing immense rise in the demand for home decoration and furnishing, we offer our clients with exclusive range of Lamp Work Glass Beads. Available in various captivating colors and designs, the Lamp Work Glass Beads are widely demanded across the national and international market. Our organization is graded amidst advanced traders of the product in Hathras(India) as well as diverse marketplaces. From the sourcing of raw material till the final dispatch, our quality auditors keep a stern eye on every sage. We offer a wide array of the Lamp work Glass Beads available in various shapes colors like square, cubical, cylindrical etc.